Hands on, fun Interactive and Educational! Georgia's Premier Otter Experience at your fingertips! **We want you to fully enjoy your encounter or experience so you will not be allowed to take your own photos. Unless you are doing the observers option. Otter Splash & Experience both include personal Otter bonding time! Asian Small clawed Otters are curious, interactive and inquisitive. North Georgia Zoo & Farm provides interactive Otter experiences where you can interact with the otters. The only hands on otter encounter and experience in Georgia. Some prices do not include Zoo Admission. Zoo Admission is required for all encounters & experience. Reservations Required. 15-20 minute experience with 1-2 young otters. You will interact, play, and learn about their natural behaviors while they greet you and play with their toys. 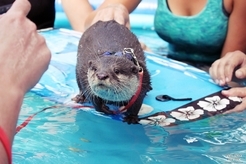 A hands on experience like no otter! Private 30-45 min interacting with 1-2 otter pups. Come experience play time with the adult otters, learn about and socialize with them! Enjoy training time with the Otters and more! For ages 8 and up. This tour is around 45 min long. Pictures of your experience: $50. Know someone who loves Otters? We can bring the Otters to you! Click here for more info!